THE UK has had its coldest night of the winter so far as the cold snap continues to cause icy conditions across the country. 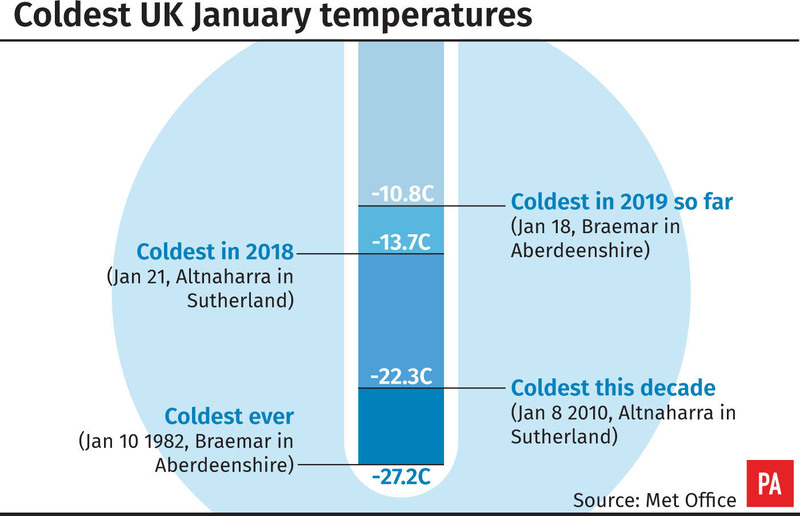 Braemar in Aberdeenshire was the coldest spot in the country as temperatures dipped to minus 11C (12.2F), 0.2C lower than the previous record for 2019. All four countries in the United Kingdom set new records for the 2018/2019 winter with Sennybridge, Powys, dropping to minus 9.3C (15.3F), Katesbridge in Northern Ireland falling to minus 8.2C (17.2F) and Redesdale Camp, Northumberland, recording temperatures of minus 10.4C (13.3F). Glasgow has woken up to temperatures as low as -5C this morning. The freezing temperatures have led to weather warnings being issued by the Met Office for snow, ice and fog on Thursday and into Friday. He said: “It’s been a very, very cold night. On Thursday night we could see similar temperatures in Scotland, but Northern Ireland, England and Wales probably won’t be quite as cold. Southeastern Trains said 21 services were being cancelled or altered on Thursday morning to minimise the impact of ice forming on the rails and ensure lines were clear and that it would run its “winter weather timetable” on Friday due to the forecast. Manchester and Liverpool airports were brought to a standstill on Wednesday morning, and several schools closed across the UK due to the harsh conditions. Mr Wilson said central England and Wales could bear the brunt of the snow on Thursday afternoon and into the evening as wet weather coming through the south-west England turns wintry, with some places seeing up to 4in of snow. Yellow weather warnings for ice are in place in north-western Scotland and the Northern and Western Isles, alerting travellers to be wary of slippery roads. A similar warning is in place for north-west England, south-west England, Wales, Yorkshire and The Humber. The Midlands, east of England, Greater London and the south of England should also beware of fog making driving on icy roads even more complicated on Thursday morning. A yellow warning for snow is also in place across large swathes of England and is due to remain in place until late on Friday night. Most of Scotland should also be prepared for snowfall, the Met Office warned.